In the morning, three of us attended an English service at Haidian Christian Church. Afterwards, we walked to a restaurant nearby for delicious Peking roast duck! When we walked inside, there was a seating room with tables and a large window separating the room from the duck oven! We ordered roast duck (obviously). It was presented in an elegant way I’d never seen before, especially at Chinese restaurants in the SF Bay Area. A number of ingredients surrounded a basket of Peking duck wrappers (or ‘pancakes’ as some folks call ’em). Lettuce, cucumber, turnip, onion, hoisin sauce, salt, minced garlic, and prune jam. Since the wrappers were thin, some were inseparable and had two layers stuck together. But that didn’t take away the fun in making my wrap! A hot packet in hot water!!! Ingenious. I’ll have to admit, Peking duck is way better in Peking (now called Beijing). 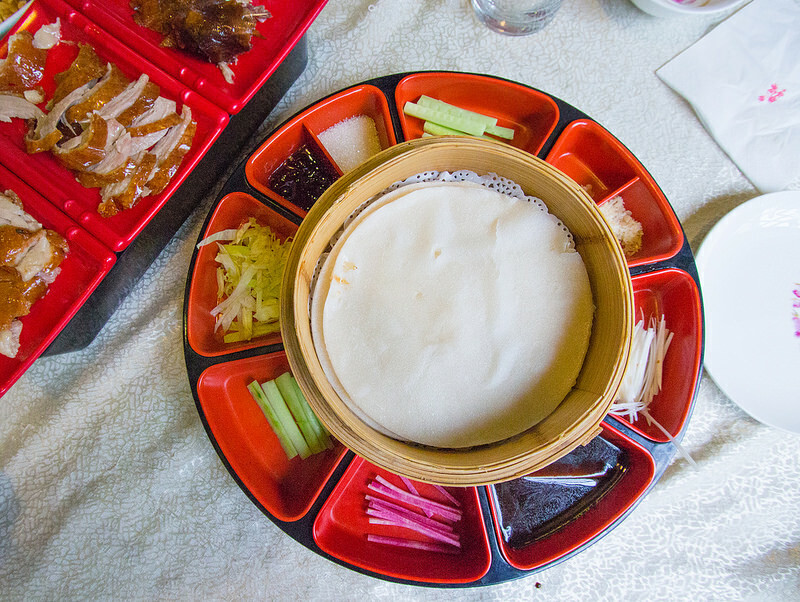 If you’re in the city, don’t miss out on getting delicious roast duck!